There are several parts to an Episode. The Date and Time information are separate fields from your Episode Title (which you may also put the Date and Time into if you want). You can edit this information in the Episode Edit panel. The term that you may be used to called "Archive", is simply known as your "Previous Episodes" in Omnia. An Episode is "live" when it is currently being streamed, and immediately becomes a "Previous Episode", or archived, once you finish streaming. One key difference with how Omnia treats Episodes is that we never "archive" your video and make it unavailable to you or your viewers like some livestream providers. If you are wanting to hide Episodes from viewers, you can unpublish an Episode, and then make a playlist with "Only Published" Episodes. You can toggle your Episode's from Published status on and off using the switch at the top of the Episode Edit screen. 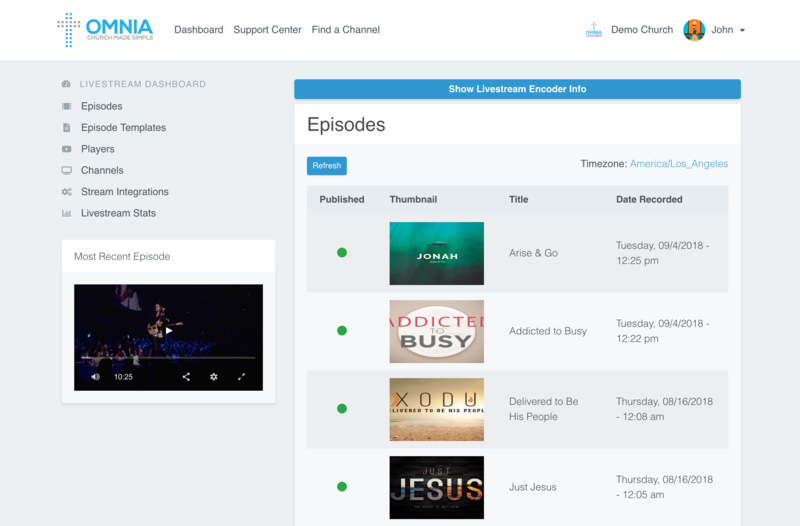 An Episode's Published status will determine whether it shows up in things like your Embedded player on your website and your Omnia Channel.